The video can also be watched in Estonian and is subtitled in German. Click on the links to get to the videos. Last week we made lots of usability improvements to our Add/Withdraw funds functionality and views. Our „Add funds“ and „Withdraw funds“ features are now better positioned on your Dashboard for easy access and both pages are more clear and usable. They are both located on the left-hand side of your Dashboard menu. 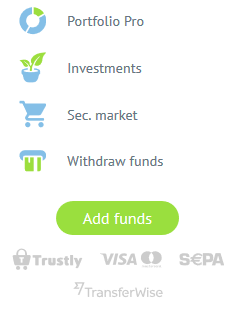 You’ll find the green „Add funds“ button left-hand side menu which takes you to a page with a new outlook that is user friendly with four deposit options – Trustly, Visa/Mastercard, SEPA and TransferWise. You will also notice that all four payment options have separate directs links just under the „Add funds“ button. The „Withdraw funds“ also has a page of its own and you can get there from the Dashboard left-side menu.